Quasi-periodic pulsations (QPPs) with the characteristic time scales from a few seconds up to tens of minutes are frequently seen in the time profiles of solar and stellar flare emission (Nakariakov et al., 2016 ). Among all the possibilities of QPPs explanation, two reasons are discussed more actively: magnetohydrodynamic (MHD) oscillations in plasma waveguides and periodic reconnection. A solar flare showing clear quasi-periodic pulsations in X-rays, microwaves and followed by type III radio bursts is a good object for testing the different models. We analysed a solar flare showing clear quasiperiodic pulsations in X-rays, microwaves (signatures of electrons in coronal loops) and type III radio bursts (signatures of electrons escaping to the high corona and interplanetary space) to test the different models (Kupriyanova et al., 2016 ). Figure 2. 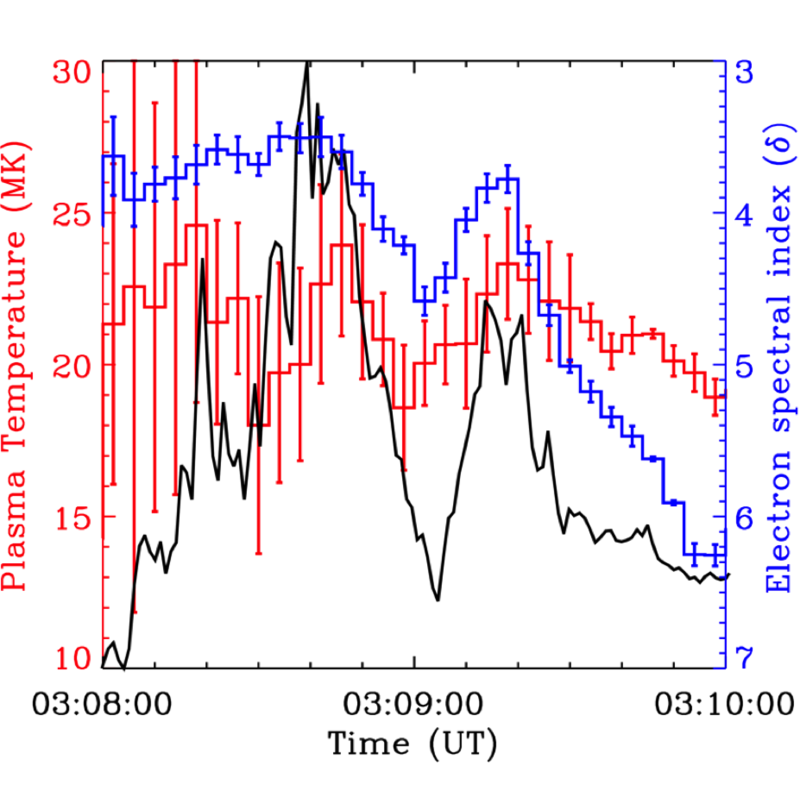 Time profiles of plasma temperature (red curve) and electron spectral index (blue curve) defined using X-ray data. The good correlation between the time profiles in microwaves and HXRs (Figure 1) suggests that both emissions are generated by the same, time-varying population of accelerated electrons. Moreover, the time evolution of the electron spectral index is characterized by the presence of three peaks which coincide in time with the peaks of microwave emission at 17 GHz (Figure 2). There is an expected time delay between a peak in microwaves and a corresponding peak at 32 MHz, related to the travel time of the electrons from the acceleration region to the upper corona. Assuming a density model (Parker, 1958 ) of the quiet Sun, we attribute 32 MHz to a height of 5.4 × 1010 cm. A modest type III speed of 0.2 c (where c is the light speed) gives just under 10 s travel time that is similar to the delay found between the rise in microwaves and the rise in type III emission (Figure 1). A modest type III speed of 0.2 c (where c is the light speed) gives just under 10 s travel time that is similar to the delay found between the rise in microwaves and the rise in type III emission (Figure 1). Analyzing the microwaves, hard X-rays and type III bursts emitted during a solar flare we found the following results: a stable 40–50 s periodicity from the microwaves, hard X-rays and type III radio bursts, a similar periodic behavior of the electron spectral index, and an absence of any periodicity in the thermal X-ray light curves or the thermal X-ray source size. We conclude that the observed QPPs were most probably caused by quasi-periodic acceleration of electrons caused by oscillations in the current sheet rather than high-amplitude MHD pulsations. This work was (partly) carried out on the Solar Data Analysis System operated by the Astronomy Data Center in cooperation with the International Consortium for the Continued Operation of Nobeyama Radioheliograph (ICCON). The authors thank the RHESSI team and the team of the Radio Solar Telescope Net (RSTN) for possibility to use their data in the current study. This research was partly supported by the grants of the Russian Foundation for Basic Research No.No. 14-02-00924, 15-02-08028, 15-02-03717, by the Program of Russian Academy of Sciences No.22, by the RAS Presidium program No. 0344-2015-0017, by the Marie Curie FP7-PEOPLE-2011-IRSES-295272, and by STFC consolidated grant ST/L000741/1 (HASR). EK is a beneficiary of a mobility grant from the Belgian Federal Science Policy Office.